"Wait a little longer. Such haste is not good. Baba was not like ordinary people. Baba's words come true." All the devotees were happy on seeing that Baba had regained consciousness. Everyone ran to take his darshan. All you listeners ask your own selves for a moment why should one be happy. 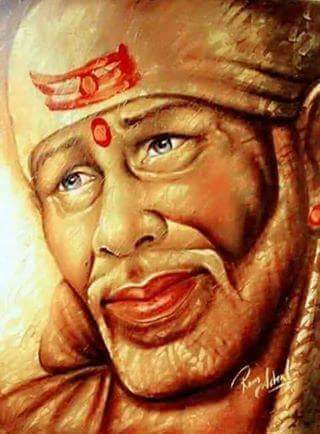 Sai fills the movable and the immovable. Sai is within us and outside us too. Sai is in your and my heart. He stays there permanently. Baba is not in body now. Yet, one who remembers him is helped by him even now, as in the past, when Baba was in the body. Baba's words are destined. One should have faith and experience this. If they do not come true immediately, they will do so in time to come. "Your bad actions will be destroyed. Your merits and demerits will be reduced to ashes. I will consider you fortunate when I see the bag for alms under your arm. "When you abandon all worldly pleasures, consider duality as improper, control your palate and lust, then I will consider you fortunate. " Those who love me most, they see me always before them. "I constantly care for him who only longs for me and for him no one is equal to me. I act according to his wishes. Chapter - 44 Sree Sai Samartha Satcharita.